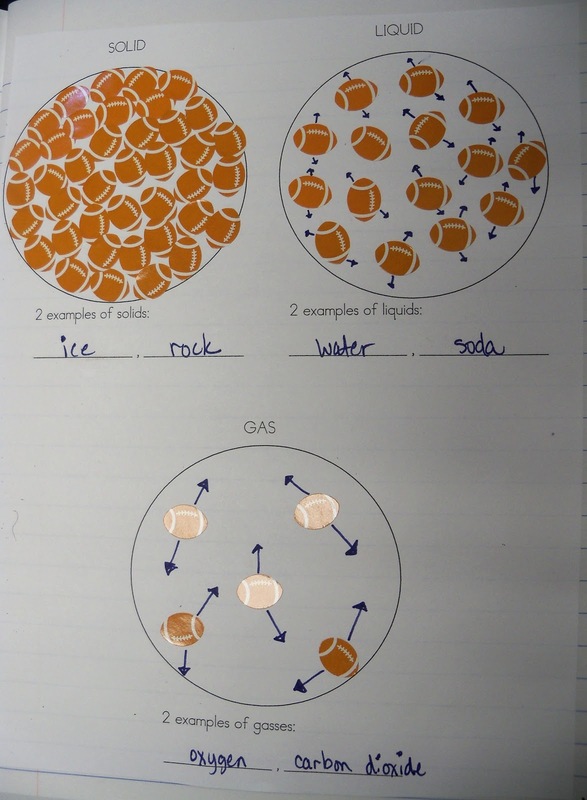 We've been discussing ways to classify matter, and one way is by states of matter. By the time I get 4th graders, they've had lots of exposure to solids, liquids, and gases. Determining the state of matter for an object is nothing new. 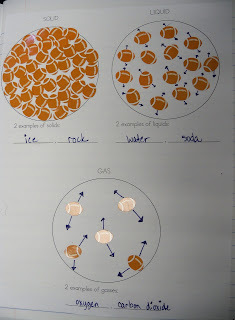 It's my job to introduce how heat can affect a state of matter, and what happens to the particles as the state changes. We began by marking off a "jar" on the floor. We just used chairs as our boundaries. We packed ourselves into the "jar" and pretended to be the particles of a solid block of ice, frozen in a jar in the freezer. We were all touching, and no one was really moving much. Then we pretended someone took us out of the freezer and sat us down on the counter of a comfortably-warm room, so we started to slowly melt into a liquid. We began to move around and bump into each other, still within our jar. Finally, someone held us over the stove, so we began to move faster and faster, bumping into each other and the walls of the jar, until finally we became a gas and came out of the jar and flew around the room. We compared the particles of a gas to a sugared-up toddler. Ha ha!! Then we went in reverse and eventually became a liquid, then a solid again.